You can use a picture as the background for a slide or slides. You can adjust the picture's transparency after you add it to the slide. 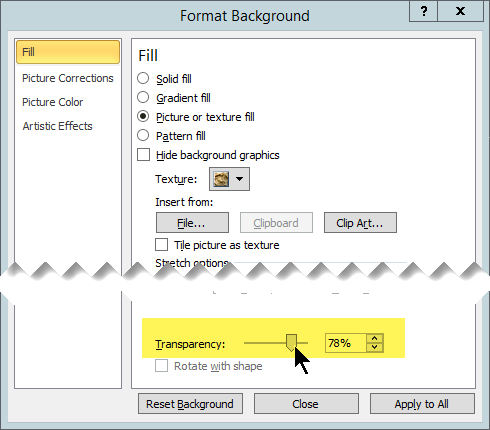 Right-click the margin of the slide and then select Format Background. 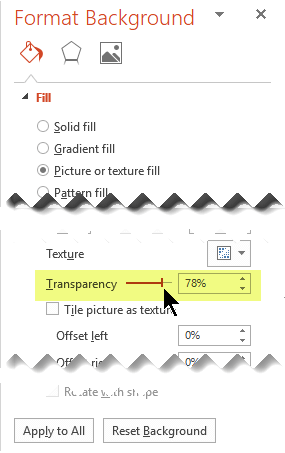 In the Format Background pane, choose Picture or texture fill. To adjust the picture's relative lightness, slide the Transparency bar to the right. To apply the background picture to all slides in your presentation, choose Apply to All. Otherwise, simply close the Format Background pane. 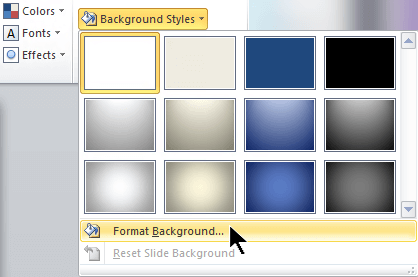 In Normal view, select a slide that has the background pattern or picture you want to remove. On the Design tab of the toolbar ribbon, in the Customize group at the far right end, select Format Background. 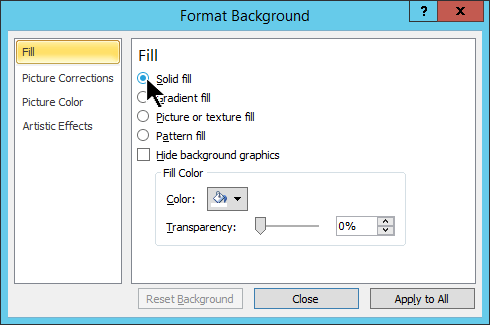 In the Format Background pane, under Fill, select Solid Fill. Select the down arrow next to the Color button. A gallery of colors appears. Select the white color. Your current background is removed, and the background of the slide is now white. If you want to make the same change to the other slides in the presentation, choose Apply to All at the bottom of the Format Background pane. 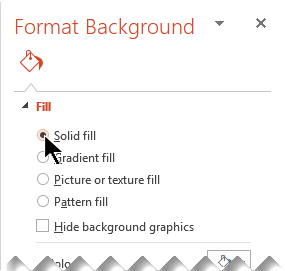 Under Fill, choose Picture or texture fill. To apply the background picture to all slides in your presentation, choose Apply to All. Otherwise, select Close. On the Design tab of the toolbar ribbon, in the Background group at the far right end, select Background Styles and then select Format Background. In the dialog box, on the Fill tab, select Solid Fill. Select the down arrow next to the Color button and from the gallery of options select the white color. If you want to make the same change to the other slides in the presentation, choose Apply to All.